Boogie Monsters is a fun filled video slot with a quirky and humorous Halloween theme that promises great entertainment for players of all ages. 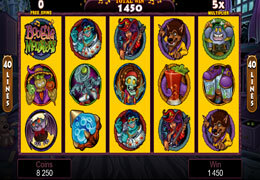 Icons depicted in this video slot include colourful monsters, crazy werewolves, scarecrows and a rock ‘n roll with purple hair. The high quality graphics and sound effects are very impressive and add character to the boogie monsters. 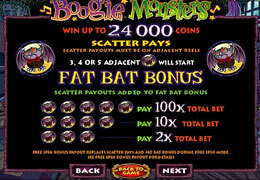 Boogie Monsters also contains some great features such as wilds, scatter, free spins, multipliers and monstrous pay outs. You will be rewarded with 15 free spins with a 5x multipliers when you have 3, 4 or 5 scatter lamps appear on the reels with a chance to re-trigger the free spins feature at any given time. The two most important icons in this video slot is the bat and lava lamp and when 3, 4 or 5 of the bats fly onto the screen they will enhance your chances of winning up to 100x plus an admission into the Fat Bat bonus round. Here you will have to expose 3 out of 12 monsters to reveal cash rewards and a massive 60x multiplier to look out for as well. Bets range from as little as $0.01 to $0.50 and you may play 10 coins per pay line per spin. There are generous pay outs in this online slot and it is ideal for all types of players.